Ever notice how a boo-boo seems to feel just a little bit better a little bit quicker when a child is wearing a band-aid with cute designs? Whatever works, I say. A company that knows all about cute bandages is Hug-a-BooBoo. The bandages feature animal characters with outstretched arms, ready to give a hug. A hippo, bear, frog, and dog make up the cute characters. There are 20 bandages to a box. 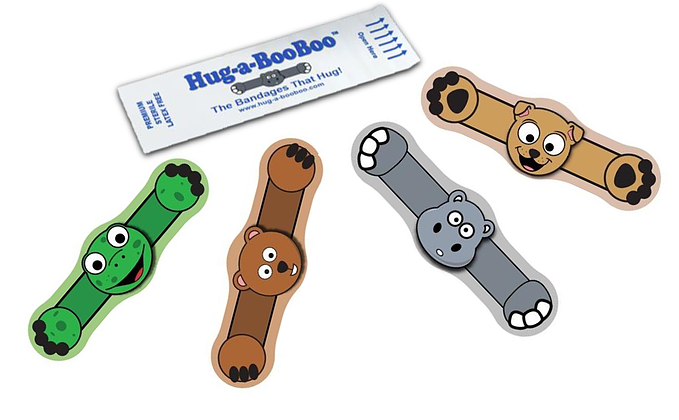 In addition to being child-friendly, Hug-a-BooBoo bandages have small amounts of extra padding in the "arms" of the characters, offering extra protection to the surrounding areas of the wound. This patent-pending feature, called "Peripheral Wound Area Protection" (PWAP), provides an extra level of comfort, protection and reassurance. Hug-a-BooBoo padding is also a whopping 18% thicker than the average child's bandage. For these bandages in particular, I like that they are unisex. I also like that they are packaged so each bandage character can be seen. With some bandages, they have cute designs but it is hard to tell which one is which due to how they're individually packaged. A child can choose which Hug-a-BooBoo bandage they'd like applied by visually looking at the bandage silhouettes. Either way, they're going to get a cute animal character that helps heal wounds. Which Hug-a-BooBoo animal would your child like best? What a cool idea! I know our lil girl will love these!!! These are awesome! I've never seen anything like them. How fun! I want to wear these too. How fun is that going to be ! ! ! I haven't seen these before. How cute is that?! I can't wait to get HugaBooBoo Bandage, they are so cute. I want to share them with my niece and nephews. My granddaughters would love these. Awww, too cute! Every mom and grandma KNOWS that lovies make boo boo's feel better so much faster! These would be adorable to keep around for my little grandson. He loves ALL animals a LOT just like Gramma and PopPop but if he had to pick a favorite of these 4, I am guessing his would be the dog.